View of the church in Harlington. Harlington was a small, rural village in Middlesex which now makes up the southern part of the borough of Hillingdon. The character of the parish has changed dramatically over the past 100 years and since 1944 it has been contained in the boundaries of Heathrow airport. 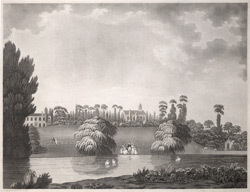 The medieval church can be seen on the hill in this print. The tower is thought to date from a later period, probably the 16th century.